It is amazing how many people seem to live alongside serious pollution and not notice it. 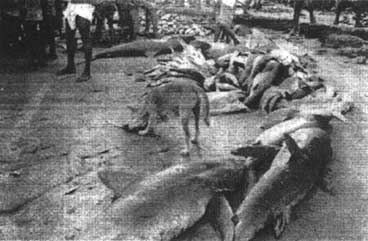 Fishery harbours and landing places around the world have traditionally been regarded as 'appropriate for insanitary conditions'. Only in the recent past has it been recognized that it is feasible to maintain clean fishery harbours provided special care is taken proactively. Fishery harbours must accommodate the special needs for (a) water supply and (b) management of solid/liquid wastes. Insanitary conditions not only result in degradation of the environment, but also in contamination of fish and rapid spoilage. They also pose serious health hazards such as typhoid, cholera, hepatitis-B, and gastro-enteritis. What is contamination? What is pollution? These are terms that need a clear definition. GESAMP (Joint Group of Experts on the Scientific Aspects of Marine Pollution) defines pollution as the introduction by man, directly or indirectly, of substances or energy into the marine environment (including estuaries) resulting in such deleterious effects as harm to living resources, hazards to human health, hindrance to marine activities including fishing, impairment of quality for use of sea water and reduction of amenities. Contamination on the other hand is the presence of elevated concentrations of substances in the environment above the natural background level for the area and for the organism. Contamination of water by physical and bacteriological agents, be it drinking water, ice water or harbour water, may be evaluated by laboratory tests. Test results are usually expressed in parts per million (milligrams per litre or simply ppm) or parts per billion (micrograms per litre or ppb) for physical parameters; and bacterial counts per 100 millilitres for organisms. For both types of contaminant, maximum levels are usually stipulated and these levels may differ from country to country. Contaminants in modest quantities are present even in clean aquatic environments. A few metals such as copper, selenium, iron and zinc are essential nutrients for fish and shellfish. Contamination occurs when there is a significant increase in their levels. Problems related to chemical contamination of the aquatic environment are nearly all man-made. Industrial effluents, sludge from sewage treatment plants, agriculture run-offs and raw untreated sewage from urban populations and industry-all these contribute to chemical contamination of the environment. The main concern of harbour managers however, is that clean water chemically equivalent to drinking water is needed for fish washing, ice making and fish processing. Many chemicals present above a certain level in water can be a public health hazard. Some interfere with water treatment processes, some stain fixtures and plumbing, a few may cause undesirable scaling and may be aesthetically objectionable. Due to the acute shortage of potable water in many countries, raw sea water is often utilized during fish handling at sea or in port. This means that in addition to tap water, harbour basin or estuarine waters could be a potential source of contamination. Pollution of harbour waters due to dumping of untreated sewage in contiguous waters and the harbour basin, is often the most common cause for seafood-related diseases and epidemics. But it is a matter for concern that harbour water quality is heavily influenced by human activity not only within the harbour complex but in the surrounding environment as well. Effluents from aquaculture ponds, agriculture runoff, sewage discharge, toxic effluents from industry into the contiguous water body, all affect the marine environment through biological, chemical and physical interactions over different temporal and spatial scales. In addition there may be impacts that arise as a consequence of accidents or failure of normal operations such as oil spills in coastal waters. 3. Standard of cleanliness of the port in general. In order to comply with these directives, a fishing port manager needs to have a good understanding of both the natural environment existing around the fishing harbour as well as the environment generated within the harbour's infrastructure. Since water is the underlying link which connects the various fishing activities together, (such as netting, storing and icing onboard, handling inside a harbour and eventual sale to consumers) and since most water supplies originate outside the harbour area, the fishery harbour manager must ensure that water entering the harbour is chemically and biologically fit for human consumption. Unfortunately, this task is rendered more difficult in countries with a strong indigenous cottage industry, which, through the indiscriminate use of highly toxic chemicals (chemical dyes, pesticides, paints and solvents), generally leads to problems associated with groundwater pollution. h) Dissolved inorganics (nuisance chemicals). The presence of suspended solids in water gives rise to turbidity. Suspended solids may consist of clay, silt, airborne particulates, colloidal organic particles, plankton and other microscopic organisms. The presence of particulate matter in water, whether organic, inorganic or due to higher micro-organisms, can protect bacteria and viruses from the action of disinfectants. The adsorptive capacity of some suspended particulates can lead to entrapment of undesirable inorganic and organic compounds present in the water and in this way, turbidity can bear an indirect relationship to the health aspects of water quality. Airborne particulate matter is of particular concern to facilities located near mineral stockpiles (coal, iron ore, bauxite, etc.) or down wind from large power stations (fly ash), timber saw mills (saw dust) or cement factories (cement dust). Rain water collection systems are particularly sensitive to such airborne particulates because they usually augment local potable water systems and act as conduits for pollutants to enter potable water systems. Large quantities of aromatic hydrocarbons are also generated by the combustion of fossil fuel in oil-fired power stations and industrial kilns. Composed principally of proteins, carbohydrates, and fats, biodegradable organics are measured most commonly in terms of BOD (Biological Oxygen Demand). BOD is the quantity of oxygen required for the oxidation of organic matter by bacterial action in the presence of oxygen. The higher the demand for oxygen (the more organic the pollution) the less is the oxygen left to support life. Urban sewage commonly has a BOD of 500 mg/litre. Harbour basin water should have a BOD in the range of 50 to 150 mg/litre. The most common and widespread danger associated with drinking water is contamination, either directly or indirectly, by sewage, by other wastes, or by human or animal excrement. If such contamination is recent, and if among the contributors there are carriers of communicable enteric diseases, some of the living causal agents may be present. The drinking of water so contaminated or its use in the preparation of certain foods may result in further cases of infection. Natural and treated waters vary in microbiological quality. Ideally, drinking water should not contain any microorganisms known to be pathogenic to man. In practice, this means that it should not be possible to demonstrate the presence of any coliform organism in any sample of 100 ml. Pathogenic organisms found in contaminated water may be discharged by human beings who are infected with disease or who are carriers of a particular disease. The principal categories of pathogenic organisms are, as shown in Table 1.1, bacteria, viruses, protozoa and helminths. Faecal pollution of drinking water may introduce a variety of intestinal pathogens - bacterial, viral, and parasitic - their presence being related to microbial diseases and carriers present at that moment in the community. Intestinal bacterial pathogens are widely distributed throughout the world. Those known to have occurred in contaminated drinking water include strains of Salmonella, Shigella, enterotoxigenic Escherichia coli, Vibrio cholerae, Yersinia enterocolitica, and Campylobacter fetus. These organisms may cause diseases that vary in severity from mild gastro-enteritis to severe and sometimes fatal dysentery, cholera, or typhoid. The modes of transmission of bacterial pathogens include ingestion of contaminated water and food. The significance of the water route in the spread of intestinal bacterial infections varies considerably, both with the disease and with local circumstances. Among the various waterborne pathogens, there exists a wide range of minimum infectious dose levels necessary to cause a human infection. With Salmonella typhi, ingestion of relatively few organisms can cause disease; with Shigella flexneri, several hundred cells may be needed, whereas many millions of cells of Salmonella serotypes are usually required to cause gastroenteritis. Similarly, with toxigenic organisms such as enteropathogenic E. coli and V. cholerae as many as 108 organisms may be necessary to cause illness. The size of the infective dose also varies in different persons with age, nutritional status, and general health at the time of exposure. The significance of routes of transmission other than drinking water should not be underestimated as the provision of a safe potable supply by itself will not necessarily prevent infection without accompanying improvements in sanitation and personal habits. Education in simple applied and personal hygiene is essential. Surveillance of the bacterial quality of water is also important, not only in the assessment of the degree of pollution, but also in the choice of the best source and the treatment needed. Bacteriological examination offers the most sensitive test for the detection of recent and therefore potentially dangerous faecal pollution, thereby providing a hygienic assessment of water quality with a sensitivity and specificity that is absent from routine chemical analysis. It is essential that water is examined regularly and frequently as contamination may be intermittent and may not be detected by the examination of a single sample. For this reason, it is important that drinking water is examined frequently by a simple test rather than infrequently by a more complicated test or series of tests. Priority must always be given to ensuring that routine bacterial examination is maintained whenever manpower and facilities are limited. Viruses of major concern in relation to waterborne transmission of infectious disease are essentially those that multiply in the intestine and are excreted in large numbers in the faeces of infected individuals. Concentrations as high as 108 viral units per gram of faeces have been reported. Even though replication does not occur outside living hosts, enteric viruses have considerable ability to survive in the aquatic environment and may remain viable for days or months. Viruses enter the water environment primarily by way of sewage discharges. With the methods at present available, wide fluctuations in the number of viruses in sewage have been found. On any given day, many of the 100 or so known enteric viruses can be isolated from sewage, the specific types being those prevalent in the community at that time. Procedures for the isolation of every virus type that may be present in sewage are not yet available. As sewage comes into contact with drinking water, viruses are carried on and remain viable for varying periods of time depending upon temperature and a number of other less well-defined factors. It is generally believed that the primary route of exposure to enteric viruses is by direct contact with infected persons or by contact with faecally contaminated objects. However, because of the ability of viruses to survive and because of the low infective dose, exposure and consequent infections may occur by less obvious means, including ingestion of contaminated water. Explosive outbreaks of viral hepatitis and gastroenteritis resulting from sewage contamination of water supplies have been well documented epidemiologically. In contrast, the transmission of low levels of virus through drinking water of potable quality, although suspected of contributing to the maintenance of endemic enteric viral disease within communities, has not yet been demonstrated. In some developing areas, water sources may be heavily polluted and the water-treatment processes may be less sophisticated and reliable. Because of these factors, as well as the large number of persons at risk, drinking water must be regarded as having a very significant potential as a vehicle for the environmental transmission of enteric viruses. As with other microbial infections, enteric viruses may also be transmitted by contaminated food. Enteric viruses are capable of producing a wide variety of syndromes, including rashes, fever, gastroenteritis, myocarditis, meningitis, respiratory disease, and hepatitis. In general, asymptomatic infections are common and the more serious manifestations are rare. However, when drinking water is contaminated with sewage, two diseases may occur in epidemic proportions - gastro-enteritis and infectious hepatitis. Apart from these infections, there is little, if any, epidemiological evidence to show that adequately treated drinking-water is concerned in the transmission of virus infections. Gastroenteritis of viral origin may be associated with a variety of agents. Many of these have been identified only recently occurring as small particles with a diameter of 270-350 microns in stools of infected individuals with diarrhea. Viral gastroenteritis, usually of 24-72 hours' duration with nausea, vomiting and diarrhea, occurs in susceptible individuals of all ages. It is most serious in the very young or very old where dehydration and electrolyte imbalance can occur rapidly and threaten life if not corrected without delay. Hepatitis, if mild, may require only rest and restricted activities for a week or two, but when severe it may cause death from liver failure, or may result in chronic disease of the liver. Severe hepatitis is tolerated less well with increasing age and the fatality rate increases sharply beyond middle age. The mortality rate is higher among those with pre-existing malignancy and cirrhosis. Protozoa are single-celled eucaryotic micro-organisms without cell walls. The majority of protozoa are aerobic. Protozoa feed on bacteria and other microscopic microorganisms. Of the intestinal protozoa pathogenic for man, three may be transmitted by drinking water: Entamoeba histolytica, Giardia spp., and Balantidium coli. These organisms are the etiological agents of amoebic dysentery, giardiasis and balantidiasis, respectively, and have all been associated with drinking water outbreaks. All three have worldwide distribution. As a group, the intestinal pathogenic protozoa occur in large numbers in the faeces of infected individuals in man and a wide variety of domestic and wild animals. Coliform organisms do not appear to be a good indicator of Giardia or E. histolytica in treated water because of the increased resistance of these protozoans to inactivation by disinfection. A great variety of helminth eggs and larvae have been detected in drinking water and it is clear that all those infective to man should be absent if the water supply is to be safe. However, the majority of helminths are not waterborne and it is neither feasible nor necessary to monitor water for them on a routine basis. Two groups of helminths are more directly related to water supplies: those transmitted wholly by the ingestion of infected copepod intermediate hosts and those whose cercariae are directly infective to man. A third category groups the remainder of the species. The first group (Dracunculus, Spirometra) comprises Helminths that develop in aquatic copepods and are acquired by man ingesting water containing the intermediate host crustacea. The most important member in this group is the guinea-worm (Dracunculus medinensis), a filarial parasite of man. Tapeworms of the genus Spirometra, though much rarer in man, also have a stage in aquatic copepods. Adult worms are found in the small intestine of cats. Eggs pass out in the faeces and hatch in water where they may be ingested by copepods. The second group (Schistosoma, Ancylostoma, Necator) comprises a miscellaneous group of flukes and roundworms whose infective larvae are able to penetrate the human skin and mucous membranes. The human hookworms Ancylostoma duodenale and Necator americanus, both with a wide tropical and sub-tropical distribution, have eggs that hatch and develop in the soil to the third stage larvae, which then reinfect man by penetrating the skin. Hookworms of domestic animals may also invade man. The third group of Helminths has resistant eggs or cysts infective to man. If these gain access to drinking water and are ingested, man becomes infected. The most widespread intestinal Helminths are Ascaris lumbricoides (roundworm) and Trichuris trichuria (whipworm). The human tapeworms of the genera Hymenolepis, with a direct life cycle, and Echinococcus, where man is infected by ingesting eggs usually acquired from dogs, have the potential for spread in drinking water. Both Malaria and Dengue are not transmitted directly by drinking water but by vectors or carriers that breed in water, in this case mosquitoes. In order to prevent the spread of these diseases, it is of the utmost importance that in all endemic areas, drinking water reservoirs within the port area be adequately covered to prevent mosquitoes from gaining access to the free water surface, where they can breed unhindered. · Water cisterns in all toilets. All manholes should be covered with purpose-made manhole covers and all vents should be equipped with filters or mosquitoe nets. Nitrates and nitrites are considered together because conversion from one form to another occurs in the environment. The health effects of nitrate are generally a consequence of its ready conversion to nitrite in the body. Nitrates are widely present in substantial quantities in soil, in most waters, and in plants, including vegetables. Nitrites also occur fairly widely, but generally at very much lower levels than nitrates. Nitrates are products of oxidation of organic nitrogen by the bacteria present in soils and in water where sufficient oxygen is present. Nitrites are formed by incomplete bacterial oxidation of organic nitrogen. One of the principal uses of nitrate is as fertilizer. Nitrates are also used in explosives, as oxidizing agents in the chemical industry and as food preservatives. Its occurrence in water is brought about by indiscriminate fertilizer use, decaying vegetable and animal matter, sewage effluents, industrial discharges and last but not least, leachates from refuse dumps. Nitrates in the water are limited to 10 ppm. These are organic or inorganic compounds selected on the basis of their known or suspected carcinogenicity, mutagenicity, teratogenicity or high acute toxicity. Arsenic is notorious as a toxic element. Its toxicity, however, depends on the chemical (valency) and physical form of the compound, the route by which it enters the body, the dose and duration of exposure and several other biological parameters. It is recommended that, when water is found to contain arsenic at levels of 0.05 ppm, an attempt should be made to ascertain the valency and chemical forms of the element. Arsenic is commonly associated as an alloying additive with lead solder, lead shot, battery grids, cable sheaths and boiler piping. Nowadays, most arsenic originates from paints or pharmaceuticals and is commonly found in sewage. The concentration of arsenic in sea water is around 0.002 ppm. The primary concerns are carcinogenicity and mutagenicity. Asbestos is a general term for fibrous silicate minerals of the amphibole and serpentine mineral groups. Six minerals have been characterized as asbestos: chrysotile, crocidolite, anthophyllite, tremolite, actinolite and amosite. Asbestos is commonly found in domestic water supplies. The use of asbestos cement (170 g of asbestos per kg - 80% chrysotile and 20% crocidolite) for pipes in distribution systems could contribute to the asbestos content of drinking water. Background levels are reported to be in the range of less than 1 million to 10 million fibres per litre. The primary concern is carcinogenicity. Barium is present in the earth's crust in a concentration of 0.50 g/Kg and the mineral barytes, barium sulphate, is the commonest source. Traces of barium are present in most soils. Barium is also present in traces in many foodstuffs, such as brazil nuts. Barium is also used in various industrial processes, such as in vacuum tubes, spark-plug alloys, Getter alloys, Fray's metal and as a lubricant for anode rotors in X-ray machines. Drinking water should not contain more 0.050 ppm. Beryllium is commonly found as part of feldspar mineral deposits and may exist as the mineral beryl in small localised deposits. The primary source of beryllium in the environment is the burning of fossil fuels, although contamination is normally light. Beryllium can enter the water system through weathering of rocks in ground acquifers, atmospheric fallout on rain water collection systems and industrial and municipal discharges. Beryllium is used in metal alloys and certain electrical components. Not all countries have set standards for limits of beryllium in drinking water. Those that have, limit its presence to 0.20 ppb. As a result of geochemical differences, levels of selenium in soil and vegetation vary within broad limits. The chemical form of selenium, and thus its solubility, is another decisive factor as regards its presence in drinking water. Selenium has been identified as an essential nutrient in several animal species, including man. Dietary selenium levels of 5 mg/kg of food or more may cause chronic intoxication, and in seleniferous areas this value has been considered as the dividing line between toxic and non-toxic feeds. Drinking water in general does not represent the only or main source of selenium exposure for the resident population in seleniferous areas. There is a range of selenium intake by humans that is consistent with health, and outside this range deficiency or toxicity can occur. Selenium in drinking water is limited to 0.01 ppm. Selenium is widely used in the electronics industry, TV cameras, solar batteries, computer cores, rectifiers, xerographic plates and ceramics as a colourant for glass. It is also used as a trace element for animal feeds. Silver occurs naturally in elemental form and as various ores. It is also associated with lead, copper and zinc ores. Because some metals such as lead and zinc are used in distribution systems and also because in some countries silver oxide is used to disinfect water supplies, silver levels in tap water may sometimes be elevated. The levels of silver in drinking water should not exceed 1 ppb. In industry, silver is used in the manufacture of silver nitrate, silver bromide and other photographic chemicals, water distillation equipment, mirrors, silver plating equipment, special batteries, table cutlery, jewelry, dental medical and scientific equipment including amalgams. This group of contaminants is wide ranging and consists of chlorinated alkanes (carbon tetrachloride), chlorinated ethenes (polyvinyl chloride or PVC), polynuclear aromatic hydrocarbons (naphtalene, coal tar), pesticides, herbicides and fumigants (DDT, Endrin, Aldrin, Lindane, Methoxychlor, Toxaphene and Silvex), Mono-Dichlorobenzenes (solvents), Benzenes (Benzene, Toluene), Phenols and Chlorophenols and Trihalomethanes (Chloroform, Bromoform). One of the major uses of chlorinated alkanes in the chemical industry is as an intermediate in the production of other organochlorine compounds. They are therefore produced in large quantities and consequently many are found in raw and finished drinking water. Carbon Tetrachloride is a haloalkane with a wide range of industrial and chemical applications. It has been found to be an occasional contaminant of chlorine used in the disinfection of drinking water but is not produced in drinking water as a result of the chlorination process itself. Carbon Tetrachloride was extensively used as a propellant for aerosols. This chemical has been found to be a carcinogen to laboratory animals The guideline limits this chemical to 3 ppb. This group of compounds is used widely in a variety of industrial processes as solvents, softeners, paint thinners, dry-cleaning fluids, intermediates, etc. Because of their wide use, they are often found in raw and treated drinking water. Because of their high volatility, they are usually lost to the atmosphere from surface water and therefore generally occur at lower concentrations. Vinyl chloride is mainly used for the production of PVC resins which, in turn, form the most widely used plastics in the world. Low concentrations of PVC have been detected in effluents discharged by chemical and latex manufacturing plants and in drinking water as a result of leaching from substandard (improperly cured) PVC pipes used in water distribution systems. Vinyl chloride is associated with cancer and is mutagenic in a number of biological systems, including Salmonella and E. Coli. Other chlorinated ethenes include 1,1-dichloroethane (used in the packaging industry), trichloroethane (used as a dry-cleaning solvent) and tetrachloroethane (used in dry-cleaning and as a degreasing agent in metal industries). The guideline limit for PVC is 20 ppb. PAH are a large group of organic compounds present in the environment from both natural and industrial sources. PAH are rarely encountered singly in the environment and many interactions can occur with mixtures of PAH whereby the potency of known carcinogenic PAH may be enhanced. These systems are not well understood, however, and their significance as regards environmental exposure to PAH is not yet clear. Contact with coal-tar based linings during distribution is known in some instances to lead to an increase in PAH concentration in water. Because of the close association of PAH with suspended solids, the application of treatment to achieve an acceptable level of turbidity will ensure that minimum PAH levels are achieved. Aromatic hydrocarbons may enter the aquatic environment of the harbour basin from discharges from vessels as ballast water, bilge pumping, engine exhaust, effluents from coastal refineries, crude oil power stations, terrestrial run-off (particularly from urban storm water containing road asphalt particles) and leaching (creosoted components from jetties and wharves). A guideline of 0.01 ppb is recommended. DDT (Dichloro Diphenyl Trichloroethane), a persistent insecticide, stable under most environmental conditions and resistant to complete breakdown by enzymes present in the soil microorganisms. Aldrin and Dieldrin, two related and very persistent pesticides which accumulate in the food chain. Currently may be used for termite control around the roots of fruit trees. Chlordane, a broad-spectrum insecticide also used for termite control and for homes and gardens. HCB or hexachlorobenzene, produced commercially for use as a fungicide. Heptachlor, another broad-spectrum insecticide used to control agricultural soil insects. Heptachlor is very persistent. Lindane, a wide-spectrum insecticide of the group called organochlorine insecticides and used in a wide range of applications, including treatment of animals, buildings, water (for mosquitoes), plants, seeds and soil. Methoxychlor, an insecticide used for the treatment of agricultural crops and livestock. Guidelines for refractory organics limit total "drins" to 0.03 ppb and total "ddt" to 1.0 ppb. Monochlorobenzene is widely used as a solvent and in the manufacture of several chemicals, such as insecticides and phenols. Dichlorobenzenes are important intermediates for dyes, moth repellants, deodorants, dielectric fluids, heat transfer fluids and insecticides. Benzene and Toluene are produced mainly from petroleum or as a by-product in the manufacture of gas. Both chemicals are widely used in the chemical industry both as intermediates and for the production of styrene, phenol, acetone and cyclohexene (used in manufacturing nylon). Significant quantities of Toluene are used in the manufacture of plastics, paints, detergents and as petrol additives. The guideline for benzene in water is 10 ppb. Chlorphenols are used as biocides and are found in water as a result of chlorinating water supplies containing phenol. Chlorophenols are well known for their low taste and odour thresholds. For aesthetic reasons, therefore, individual phenols should not, as a general rule, be present in drinking water above 0.1 ppb. The best approach to controlling pollution by Chlorophenols is to prevent the contamination of the source water by phenol (from petrochemical industries) and chlorinated phenolic pesticides (agriculture). Trihalomethanes (chloroform and bromoform) in drinking water occur principally as products of reaction of chemicals used in oxidative treatment reacting with naturally occurring materials present in the water. Their formation is particularly associated with the use of chlorine for disinfecting water supplies. Notwithstanding this, it is important to recognise the fact that chlorine is an effective water disinfectant and the hazards of disease arising from microbiological contaminants resulting from incomplete disinfection are substantial. Trihalomethanes have several adverse effects on health and the guideline value limits chloroform in drinking water to 30 ppb. Trace quantities of many metals are important constituents of most waters. Many of these metals are also classified as pollutants. The presence of any of these metals in excessive quantities will interfere with many beneficial uses of the water because of their toxicity. Cadmium is widely distributed in the Earth's crust, but is particularly associated with zinc and copper and is produced commercially only as a by-product of zinc smelting. Cadmium shows no signs of being an essential trace element in biological processes; on the contrary, it is highly toxic to the human organism. Like mercury, cadmium and its compounds enter the environment only from geological or human activities (metal mining, smelting and fossil fuel combustion). Cadmium and its compounds are black-listed materials, which by international agreement may not be discharged or dumped into the environment. Cadmium is a cumulative poison and a maximum level of 0.005 ppm is permitted for drinking water. Most rocks and soils contain small amounts of chromium. Chromium in its naturally occurring state is in a highly insoluble form; however, most of the more common soluble forms found in soils are mainly the result of contamination by industrial emissions. The major uses of chromium are for chrome alloys, chrome plating, oxidising agents, corrosion inhibitors, pigments for the textile glass and ceramic industries as well as in photography. Hexavalent chromium compounds (soluble) are carcinogenic and the guideline value is 0.05 ppm. Lead is not only the most abundant of heavy metals occurring in nature, it was also one of the first metals used on a large scale by man. Although it is not a nutritionally essential element, its monitoring is important because of its toxicity to human health. Lead is a cumulative poison. Most of the lead produced in metallic form, in batteries, cable sheathing, sheets and pipes, etc., is recovered and recycled, but most lead used in compound form, like paints and petrol additives is lost to the environment, eventually ending up in the aquatic environment. Lead compounds, similar to the ones used in petrol additives are reportedly being used in the production of mercurial fungicides. The presence of lead in drinking water is limited to 0.01 ppm. Although a comparatively rare element, mercury is ubiquitous in the environment, the result of natural geological activity and man-made pollution. Mercury from natural sources can enter the aquatic environment via weathering, dissolution and biological processes. Although extremely useful to man, mercury is also highly toxic to the human organism, especially in the form of methyl mercury, because it cannot be excreted and therefore acts as a cumulative poison. The potential for long-term human health hazards from ingesting mercury-contaminated fish has led several nations to establish regulations and guidelines for allowable sea-food mercury levels. Nearly all levels above 1 ppb in water are due to industrial effluents connected with chlorine and caustic soda production, pharmaceuticals, mirror coatings, mercury lamps and certain fungicides. Nickel is ubiquitous in the environment. Nickel is almost certainly essential for animal nutrition, and consequently it is probably essential to man. Nickel is a relatively non-toxic element; however, certain nickel compounds have been shown to be carcinogenic in animal experiments. Tin and its compounds are significant and controversial chemicals in the environment. As is the case with other elements, not all chemical forms of tin are equally biologically active. In contrast to the low toxicity of inorganic tin (derived from eating canned foods), some organic tin compounds, also known as organotins, are toxic. Tributyltin and Triphenyltin, constituents of anti-fouling paints, are highly toxic and their presence in harbour waters is limited generally to 0.002 and 0.008 ppb respectively. In many countries, organotin anti-fouling paints are not allowed on vessels less than 25 metres long, and the start of a fishing season generally sees an increase of this compound in the water as freshly painted vessels are launched back into the water. Dissolved inorganic compounds are generally associated with the aesthetic and organoleptic (taste and odour) characteristics of drinking water. For health-related contaminants, what is unsafe for one is unsafe for all, while aesthetic and organoleptic characteristics are subject to social, economic and cultural considerations. Since the majority of consumer complaints regarding water quality relate to its colour, taste or odour, the quality of drinking water, as perceived by the senses, largely determines the acceptability of a particular water. Aluminium does not appear to be an essential nutrient to man. Compared with the aluminium intake from food, that from water is small. The incidence of discoloration in drinking water in distribution systems increases if the aluminium level exceeds 0.1 ppm. Chlorides are widely distributed in nature and are present in mineral deposits, in sea water and some industrial processes. The taste threshold for chloride in drinking water is dependent upon the associated cation, but is usually within the range 200-300 ppm of chloride. Based on organoleptic considerations, the guideline value for chloride is 250 ppm. Colour in drinking water may be due to the presence of: coloured organic substances, such as humics (decay of vegetation in the water); metals such as iron and manganese; or highly coloured industrial wastes, of which pulp, paper and textile wastes are the most common. Chlorine from the chlorination process is likely to give rise to high levels of trihalomethanes due to the reaction of chlorine with dissolved humic substances. The presence of Copper in the water supply, although not constituting a hazard to health, may interfere with the intended domestic uses of water. Copper enhances corrosion of aluminium and zinc fittings, stains clothes and plumbing fixtures. Copper is used in alloys, as a catalyst, in anti-fouling paints and as a wood preservative. Urban sewage contains substantial amounts of copper. The human taste threshold for copper is low, 5.0 - 7.0 ppm, and the taste is repulsive. The limit for drinking water is 1.0 ppm. Soft water has a greater tendency to cause corrosion of pipes and consequently, certain heavy metals such as copper, zinc, lead and Cadmium may be present in the water. Very hard water, on the other hand, can cause considerable incrustations in pipes and fittings, especially in fish processing plants. Hydrogen sulphide occurs as a by-product in septic tanks when proteins in sewage are attacked by certain bacteria. Traces in water in excess of 0.05 ppm cause taste and odour problems. The presence of Iron in drinking water is objectionable for a number of reasons unrelated to health. Under the pH conditions existing in drinking water supplies, ferrous salts are unstable and precipitate as insoluble ferric hydroxide, which settles out as rusty silt. Such water tastes unpalatable, promotes the growth of "iron bacteria" and the silt gradually reduces the flow of water in the piping. The recommended guideline level of iron in water is 0.3 ppm. Anaerobic groundwater often contains elevated levels of dissolved manganese. The presence of Manganese in drinking water is objectionable for a number of reasons unrelated to health. At concentrations exceeding 0.15 ppm Manganese imparts an undesirable taste to beverages and stains plumbing fixtures. The recommended value is 0.1 ppm. The value of the pH, expressed as a value ranging between 1 and 10, is a good indicator of the state of the water. Values of 9.5 and above are alkaline in taste. Values of 3 and below are acidic in taste. Values lower than 6 cause problems with corrosion. Values below 4 support little life in a marine environment. Drinking water should have a pH in the range 6.5 to 8.5. Harbour water should have a pH of between 6 and 9. The sodium ion is ubiquitous in water owing to the high solubility of its salts and the abundance of mineral deposits. Near coastal areas, windborne sea spray can make an important contribution, either by fallout on to land surfaces where it drains to the water source or from washout by rain. Domestic, commercial and industrial discharges are another source of sodium in water. In general, sodium salts are not acutely toxic substances because of the efficiency with which mature kidneys excrete sodium. The effects on infants, in contrast to adults, are different because of the immaturity of infant kidneys. A maximum of 200 ppm is allowed in drinking water. Sulphates are widely distributed in nature and excessive amounts of dissolved sulphates in drinking water lead to problems with hardness. Taste threshold concentrations for the most prevalent sulphate salts are: 200 to 500 ppm for sodium sulphate; 250 to 900 ppm for calcium sulphate; and 400 to 600 ppm for magnesium sulphate. In drinking water, dissolved sulphates are limited to 400 ppm. The concentration of zinc in tap water can be considerably higher than that in surface water owing to the leaching action of zinc from galvanised pipes, brass and other zinc alloys. Zinc imparts to water an undesirable astringent taste and in concentrations in excess of 5 ppm. The water may appear opalescent and develop a greasy film on boiling. Levels of zinc should be kept well below this value. Humans have a very low taste threshold for petroleum hydrocarbons, whose taste is particularly repulsive. All components of crude oil are degradable by bacteria, though at varying rates, and a variety of yeasts and fungi can also metabolize petroleum hydrocarbons. Water-soluble components of crude oils and refined products include a variety of compounds that are toxic. High-molecular-weight tars are less damaging in the water than medium-molecular-weight compounds such as diesel. Low-molecular-weight compounds are generally unimportant because they are very volatile and rapidly evaporate. Therefore, diesel spillage at sea is more damaging than crude oil (very tarry) or petrol spillage. For harbour basin water, the limit for dissolved hydrocarbons should not exceed 0.30 ppm. Polluted harbour water can impart an unpleasant flavor to fish if used for washing. Commercial fishermen may also risk tainting a whole catch if their nets have been fouled by diesel or oil.